You can now download my past discography with my former rock band, State of Man (formerly JAD), free when you simply hit the icon in the album players below. Once you hit the icon, just opt-in via the new window that comes up and the album download will automatically begin. Come back to this window and hit the icon again to download the next album you want. 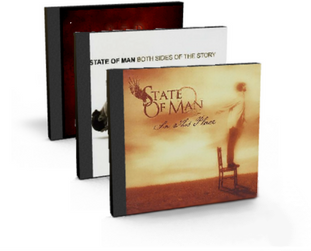 Finally, check out the multiple videos and background info on State of Man below the albums. Enjoy! I hope you enjoy the music and, if you haven’t already, don’t forget to check out my debut solo album, “Limitless Love & Light,” and my latest album, “Moment to Moment (live)” here!